In this 13th episode of The Profit on CNBC, Camping World CEO Marcus Lemonis visits West End Coffee Company. A “freshly roasted” gourmet coffee company based in Greenville South Carolina, that services local restaurants and speciality/coffee shops. Owned by ex-partners Becky Schramm and John Brown, The business was bought for $500,000 in 2012 at a period when the owners were in a relationship. Like most similar situations, things quickly turned sour for the business when the love went away a year later. Now the couple is fighting more than they are selling and this is ruining the business. Marcus is becoming quite the pro in mending businesses as well as emotional relationships so he really has his work cut out in this episode. With the business relationship of owners, Becky and John straining and the business debts mounting, time is running out for West End Coffee Company. The market for freshly grounded gourmet coffee is huge and Marcus believes that if he can keep the couple from fighting constantly and start to act as a team, there is a lot of money to be made. Marcus arrives at the West End Coffee Company production facility and immediately catches the smell of freshly grounded coffee. He likes it. However, just a few seconds later, we immediately hear John and Becky arguing about something. I can imagine how exciting it is for the employees having to hear personal relationship matters whenever their bosses are in a fight. The couple suspends arguing to welcome Marcus to the business premises and take him for a tour. They show him their storefront space and explain to him how the business works. As well as shipping to individual clients, West End Coffee Company has its products in big grocery stores like Wholefoods and Earthfair. John and Becky tell Marcus the business did $840,000 in the last year (2013) with a profit of around $40,000. The company pays around $2750 per month in rent for their warehouse/production facility and we all can agree that’s a bargain. The price will, however, increase to $3000 from September. Marcus is not impressed with this, he believes that a business should have a long lease so it can know what its immediate future is. Marcus tastes a few coffee seeds and asks Becky and John how they learnt how to roast coffee. They both reply that they have not yet had the time to learn the process and Marcus is shocked. A business owner should know the basic details about how the business is running and its processes. In West End Coffee Company, there is a master coffee roaster who stayed with them when Becky and John bought the business. Becky’s son Bryan is learning the process of roasting coffee from the master roaster so he is a backup if the roaster decides to move on. So Marcus gets introduced to Bryan. 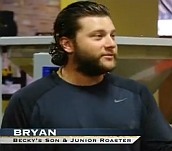 Bryan likes his job but doesn’t really like the “dynamics” between his mom Becky and her ex-partner John. Marcus tells Bryan to turn on the coffee roasting machine, he wants to see how its done and get a chance to try it out. He asks John if they get the coffee from the source or from a distributor, John tells him they get it from a distributor. Marcus isn’t impressed with this as the business could greatly increase margins if they decide in cutting out the middleman and getting the coffee directly from the suppliers. With just over a 100,000 pounds of coffee roasted per year, Marcus believes that getting just $0,30 cents per pound shaved off by buying directly from the suppliers can generate a potential saving of $30,000 a year. This is a huge amount and John and Becky should have gotten this sorted out a long time ago. Marcus also asked how much coffee West End Coffee Company can roast a week if the production facility was running on a full day shift basis, he is told that they could roast about 360,000 pounds per year. Given that the business currently roasts 100,000 pounds, Marcus calculates a 33% efficiency. He believes that pushing up production to full capacity and lining up sales, the same facility with the same equipment can generate 3 million dollars in revenue compared to their current revenue of around $840,000. With a 50% margin, Marcus is really interested in getting a piece of the coffee pie. So Marcus is impressed with West End Coffee Company‘s product and the employees. He, however, needs to understand why there is tension between owners Becky and John. So he asks them how they met. John tells him that Becky was a friend of his ex-wife and they all had a “tight relationship”/”cohorts in crime”. We don’t really know how to explain all this but with Marcus blushing red, the image below may help. Marcus asked if the relationship could be repaired if the couple is not working together, John tells Marcus he doesn’t want to have anything to do with Becky anymore and is, in fact, looking for a wife. Becky says John told her he wasn’t going to marry again and John replies that he said, he wasn’t going to marry HER. Oh noooo. This is a cruel thing to say, John. Just like in the episode Unique Salon And Spa, business never remains the same when a couple falls out of love. In the next scene, Marcus wants to find out how the business is structured and asks about the equity split between John and Becky. John says its 82-12 in his favour. West End Coffee Company was purchased for $499,000 with Becky putting in $77000 in cash. John put $12,500 in cash and $300,000 from his 401K. The remaining $100,000 was gotten from a bank loan. This splits the direct investment/ownership at 82% for John and 18% for Becky. The business, however, seems to be run like it was a 50-50 share between John and Becky. In the 2 years of running the business, John and Becky have taken a $5,000 office salary just once and they are living on savings which are now depleted. Marcus asks why the couple didn’t list the business for sale and Becky replies that she doesn’t want to sell. It’s soon clear that John made an emotional mistake as he made Becky a director of HIS 401k pension plan and she has the shareholder voting majority. He goes on to say that she can fire him as CEO if a shareholders meeting ever took place. Marcus sits the couple down and after taking a look at the financials (which are all in order) he asks a direct question to Becky. He wants to know how she ended up accepting to be in a position where she could fire John from the business when he put in over 80% of the money needed to acquire it. Becky tells Marcus that since John has threatened in the past to fire her, her only security is to hold on to that position as the majority shareholder voter. Marcus tells her that this makes her in control of John’s money and basically his destiny and this is what is creating the anger, frustration and mistrust. Becky tells Marcus that it was a twist of fate, basically a paperwork accident. In a dramatic twist of events, John soft-side comes out when Marcus asks him if he will get rid of Becky if the contract is rectified. He says that he absolutely guarantees that she will have the right to remain in the business and won’t be thrown out. Looks like Marcus has pulled out an Oprah moment. He really is good at connecting with people to bring out the best in them. So the inevitable question hits Becky. Is she willing to take the chance and sort out the contract????? SHE SAYS YES. Broken relationship between the owners/partners. Low productivity from the production facility. Lack of trust between the owners. So with that detail sorted, Marcus is ready to offer a deal to West End Coffee Company owners John and Becky. He offers to put up $200,000 for 51% of the business. He plans to use half of that to pay off the loan John and Becky took from the bank when they acquired the business. The second half will go to the business as working capital. Marcus wants to increase coffee production and the money will be used to fund this. John tells Marcus that $200,000 is not enough. That amount will value their business at less than $400,000. Marcus tells him that he valued it that low because of the wildcard discount. The wildcard being John and Becky. If they end up ruining the business then Marcus can mitigate his loses better at that valuation. John and Becky accept Marcus’ deal and he signs them a check right there. Resolve the conflict between the owners John and Becky. Improve sales, branding and packaging. Restructure the business for increasing productivity. Sort out the warehouse and inventory system. So now the deal is done, Marcus gets to work on trying to squeeze out as much production from the company in a bid to increase revenue and cut out waste. He tries his hand at making a packet of coffee but spills the beans on the floor and gets labelled a rookie. In typical Marcus fashion, he picks up a broom and cleans up the mess. 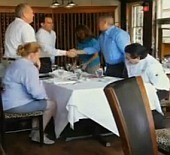 So Marcus organizes a sales meeting with Larkins restaurant. With 4 locations and a huge banquet facility, it’s the type of company West End Coffee Company needs to increase its sales. Not only is this a chance for the business to sign on a new account with Larkins, it is also a test to find out if this new partnership between the couple works. So Marcus, John and Becky meet with the owners of Larking to talk business. They find out that Larkins has a huge customer base and rough calculations show that they may generate $42,000 per year in sales if they can bag this client. The couple starts pitching and Becky almost ruins everything. Maybe it wasn’t a good idea to have her there at the meeting with Larkins. Larkins agrees to purchase their coffee from West End Coffee Company. With this sorted, Marcus and the couple jump back to the business premises to streamline the inventory. They get rid of flavours that are not performing well in sales. In the next scene, John asks Becky if the letter from her attorney stating that she has resigned from the trustee of the pension plan is ready. She says she will get it soon and John goes on about how she made a mistake with the smoothies order. Looks like John has more problems than we found out earlier. It’s like he thrives on the arguments. Marcus comes in to ask if Becky has signed the resignation papers, she says not yet because she found out that John is looking to sell the business even with the deal in place with Marcus. So this is the problem with John. He wants out of the business and Becky. 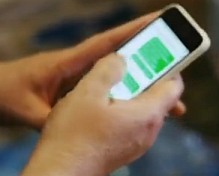 John claims he will love to do the deal with Marcus but not with Becky. So we see that John has not kept his word and the moment Becky resigns as trustee of his pension plan, there are no guarantees she will be there in the business for much longer. “I am more than done, you have no saviour. We will sell this for our original investment and start over without each other. Marcus tells John he has news for him. He is RELEVANT. He made a deal and got 51% of the business and he can throw John out whenever he likes. This, however, is not how he does business. He is hurt John would even think of trying to undercut him as he is the only one that almost mediated a release from his contract with Becky as manager of his pension plan. Marcus then says that the West End Coffee Company business is going well and the couple clearly can’t work together, He has to decide who stays and who goes. The roles the owners play in the business is clearly not defined. Marcus believes that Becky signing the “trustee of John’s 401K” resignation letter is the first step to getting the business moving again. He asks her to tell him why she hasn’t signed the papers yet and she confesses to him that she wants to have her own business. She wants to call the shots. The problem with that Becky is that you are holding John hostage and he is never going to run the business with you in peace as long as you do that. Marcus tells her this exact same thing and lets her know that now that he is part of the business, there is no need to keep that leverage point. He promises to hold the form if she signs it. They go back to the office and Becky types the resignation letter and signs it in the presence of John. Marcus now tells John that by keeping this letter, HE now controls John and he won’t be happy if John tries any funny business behind his back. In the next scene, with the long war now effectually over, Marcus now moves on with business delegating clear roles to John and Becky. Becky gets to take care of inventory while John handles the sales. So after leaving West End Coffee for a few weeks and then coming back, he is greeted once again by the great coffee smell and John and Becky fighting again. Marcus looks around the warehouse and nothing he advised them to do was done. John and Becky are arguing and we really start to understand that John MAY WANT OUT OF ALL THIS. I can understand why. He has put in a ton of cash into this business and may be looking to cash out. Marcus meets with the couple and tells them that Larkins has been waiting for West End Coffee Company to send them a quote for the coffee deal they made. This shows that John doesn’t want to be in this business even though he says he does. Or he just doesn’t want Becky in it with him. Marcus tells John he has to show more respect to Becky and he is surprised how her son Bryan still hasn’t beaten him up for how he speaks to his mom. 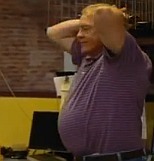 Bryan nods his head agreeing in the corner. Marcus concludes that as the couple cant work together, 1 of them has to go. John nods his head in agreement. Becky sits back and cries. She wants to have this business. It’s her only lifeline for her and her son. Marcus says to Becky that she didn’t do anything he told her to and this is why he believes that if he brought in bigger accounts, West End Coffee Company under their guidance won’t be able to handle the order. It looks like John and Becky have become complacent and are not ready at this moment to expand their business to the level Marcus wants it to be. For this reason, Marcus says he cant continue his deal with them. Marcus believes in People, Process and Product. 2 of which can be changed easily. The people, however, is the hardest thing to change and he may have failed this time. He hands back Becky her resignation letter, which puts John back into the “hostage cage“. He holds his hands to his head as he knows he has lost his chance. Marcus wished them luck, shakes their hand and walks out. He reflects on the fact that West End Coffee Company could have become a huge success with him, but its owners were put in circumstances which prevent this from ever happening. My real fear now is for Becky. How long she can hold a full grown man hostage is yet to be discovered. So that’s all folks. I hope you enjoyed the drama in this episode. We sure did. Don’t forget to let us know what you think about the episode and its characters in the comments below. Don’t forget to share this review with your friends on the social platforms. Thought you were going to provide an update of what happened since the show ended? My bad. I meant this for the next comment. Seldom have I seen two more clueless business owners. Two weeks to complete the tasks from a boss who is going to rescue your business and you don’t complete the tasks? And, worse, I knew these two were a couple hayseeds when they showed up for the meeting with Larkin dressed in shorts. Shorts at a business meeting???!! LOL, talk about two people who deserve each other. Only a matter of time before West End heads into the tank. Now you say this Scott, It is clear to me that something was wrong at that meeting. I have grown so accustomed to seeing middle age Americans in shorts and sandals at my airport that I thought nothing was strange about John and Becky going to a business meeting dressed as tourists but without the hat lol. This is a brilliant example of stupidity. When Marcus offers a global overview, they don’t get it. When he is specific, they PRETEND not to get it. When he leaves them to their own devices, they try to cheat him. These folks are a slow motion train wreck and will destroy everything they touch. Some people are scared and just dont like to grow. They want to remain a small lifestyle business. Becky keep saying “that’s why I called you” to Marcus. I guess that means she called him to help enforce her stay in the company. Smart lady, she knew Marcus will be sympathetic to a partner that is maltreated. They both wore each other down and neither deserve to own a company that has so much potential. They don’t know what to do with it! As for Marcus having sympathy, he demonstrated that to her at first but she milked it for everything she could. Hopefully someone deserving of a company with limitless potential because Greenville is and has been a town way ahead of it’s time. I am pretty sure Lemonis still owns 51% of the business. He is just not going to help them manage it. He already spent $100,000 to pay off the debt and said he the company would get the other $100,000 once they needed more inventory through increased sales. John and Becky were very stupid to sign that contract right on the spot. Everyone should read and analyze everything they sign and a contract of this magnitude should be reviewed by a lawyer. So for $100,000, it is a pretty sweet deal for Lemonis even if the company is sold or goes out of business. The coffee roasting business is much more competitive than Lemonis thought. It’s like the wine business — a lot of people got into it because they liked drinking the product and they thought it was cool. There is a huge over-supply of premium coffee all over the country. Everyone who needs coffee already has a supplier and they are constantly getting sales calls from other coffee companies. Most of the small roasters only work a couple days a week because that is all they can sell and still make a minimal profit, usually not enough to make a decent living. Lemonis must have discovered this and along with the people problems with the John and Becky, figured it wasn’t worth his time and he would just scoop up a pretty good profit when the business or assets gets sold. What I don’t get is why a restaurant would pay $7.20 for a pound of coffee? Restaurants don’t serve good coffee anymore. You could get a dark roast coffee in a big can for $2.50/lb. Multiple that by 5,800 lbs per year. Website does not list Becky on the staff page. Not sure what that says but it is interesting. I have a feeling he (Marcus) got rid of her. As much as Marcus probably thinks John is a border line sociopath, he had to figure out which one is the lesser of the two evils. John has thicker skin than Becky and that goes a lot further in food and beverage, than a whining, hypersensitive child like her! In today’s times people like her are offensive since she had a great opportunity but blew it because of a moron like him. The dude’s a snake by offering an opportunity to brokers to sell the business after negotiating to sell 51%. To me, this was staged to the point none of it was believable. Why would the “star” of the show give the owners little notice to prepare for a sales call? No experienced salesperson will take a sales call on short notice without knowning who the customer was and general knowledge of the business. People who ask for help should do some research on the “star” of the show and the production company before signing any contracts that put them in a compromising position. Yep, it’s brutally ruthless out there! And greed is on the rise. I’m sorry allenallen to contradict, but If you are a salesman worth the percentages commission you should be able to do a elevator pitch. Ive had a product which is very hard to sell and in my case of selling dance lessons I’ve only had a few seconds after meeting the clients before starting to close. Ive done well for myself in sales receiving top awards for sales, sales percentages and referrals in Fred ASTAIRE dance studios consisting of 200 studios. As a salesperson you are not paid to lead the horse to water. You are paid to make him thirsty. Its not rocket science. Everybody starts a company for money or freedom. Start from there. I think Marcus should have kept Becky and bought John out. I was actually expecting him to do that. I see why Marcus made his decision, but Becky couldn’t get what he needed done because John made her do everything. It’s clear that John is a two faced person in every aspect of his life and that’s not going to change. The company would have grown with Becky at the helm, her son by her side, Marcus guiding them and John gone. Is this real story or just a drama show? Becky is nowhere in company website. They preformed so well in front of camera as professional actors! As above point out coffee business is tough and low margin, I bet John can make more if he go back to IT service management, why stay here for lowest pay and sacrify his life out for almost no bright future?! Actually it is relatively real, at least as far as a reality television show is concerned. It really is Marcus’ money and he really does invest in the people and help them out. As far as any scripting, I’m not sure. Not sure a play by play was necessary on this page since every single person here actually watched the episode. Like others I wanted a follow-up, but unfortunately didn’t find one (I presume they sold, as that seemed their only viable option). Like other episodes Marcus would have left earlier than the episode showed. When she said she didn’t know who was the ‘sales’ person, you could tell he was done and the rest was just cursory. You could also tell the fellow there was something of a scumbag, and his go around was just proof of that (and yet another reason Marcus would have head for the hills sans cameras and keeping the show at length). Have to wonder how it must feel to have him leave and to stay in the mire and think what an opportunity they had but were too lazy to manifest, goodness. We all know the producers find the most over the top situation for better ratings. There are thousands of business owners who are inept, embezzled, breaking laws without knowing it, and on and on….all without the kookiness to get ratings. I watch the show only to find the salient business issues that I can learn from. All of the other stuff is nonsense. Family businesses are as much about psychology as they are about business acumen, product knowledge, financial and legal matters and knowing the numbers. Lack of succession planning,nepotism, using the company as a personal bank account are just a few of the real crippling issues for every family business. I feel it is really a great idea to have an outside party, with a solid business and personnel background, come in and run the company for the family. “Know your numbers, know your business” is the best take away from the Profit. Does Marcus still own 51% of the company? or did he give it up, and take his $200k back when he left? There was no deal with Marcus. John CONTROLS the website and that’s why my name was removed during or shortly after the show originally aired. John owns (AND CONTROLS) 82% and “currently” I own 18%. I was “fired” 11-17-14 and unfortunately, it’s basically in the hands of our attorneys. If this is really you, thanks for updating us. Becky. Has John sold the business and bought you out yet? Bought me out and he has not sold it. I am wishing you only good things for the future. There is no way good things can come in such a toxic environment. I am so sorry you had to go through this experience but so wish that you find the right business and can use your experiences here to make it a grand success. You have lots of good wishes coming your way!!!! Does your son still work there? And if so, how is he handling it? When Marcus was giving that speech about talking to women in the workplace did you find it sexist? I too do not need a play by play of the episode. We watch the episodes, now we are looking for updates. You continually leave us hanging! Play by play will stop now as we don’t need it anymore. When we started, we used this model to over-deliver in content so as to rank on the search engines. Now we have a small following that attracts fans and the shows’ characters to our pages, we will change the model to be more streamlined. Love watching all the shows. I’ve noticed that a lot of these businesses are successful in spite of themselves. Most of the time they have no clue about how to run a business and they are now at the point that they will not make it without help. I’m also amazed how really dishonest some of these owners are. Marcus is great with his solutions on turning these businesses around. I think John says that the labor was 12 cents a pound and if they do 100,000 pounds a year–this is only $12,000 for all labor for a year. Can someone please explain that math to me? That’s just for the labor for grinding the coffee. What has become of West End? Are they still in business? Thank you for all your updates Becky. We wish you all the best. I too am wondering if the coffee company still exists . I love Marcus and watch his facial expressions. I never really know if when he leaves the plan, does he get his money back that he has already spent? I wait each week for a new episode and there have been very few new ones, I have watched the old ones over and over….but I am waiting for some new blood. I ABSOLUTELY LOOOOVE the show!!!! I hope the original co-owners are happy/ok with whatever ended up happening. I learned a lot about coffee! Rob, just watched this episode and I was riveted ! Thanks for the updates, Love the Profit! I just watched my first show. I am so invigorated that thinking about this show is what is keeping me up at night. Marcus has confirmed so many of my business views it’s renewed my determination to put every bit of energy into my business and make it successful. He is contributing without and investment. Thank you Marcus! Oh and the producers of course. I was only able to see half of the (late-night) episode, but from what I saw, BECKY was the big problem. JOHN’s technical (process) knowledge was lacking, and both personalities were toxic, but JOHN’s lack could be cured. JOHN seemed untrustworthy after the deal, but it might have been because BECKY remained in the picture, after he sees her “hired gun” (Marcus) beginning his management takeover. BECKY seemed responsible for the biggest gaffes that appear in the first 30 minutes. On balance, I thought if anyone needed to vacate the building, it was she. Even fear for her son’s position could not justify her actions on film. An interesting side study would be how the show hurt the business. I cant imagine their customers enjoyed seeing being the curtain. Glad to see Marcus cut ties because Becky and John were incapable of running a business together. It was clear to me when Marcus identified certain tasks for each of them to take care of and neither one of them could follow through with completing their assigned task. Becky blamed John and John turned around and blamed Becky. Marcus was trying to put certain processes in place. It was eye opening to see how much expired inventory was in stock that had to be thrown away because they couldn’t manage effectively. Sorry to burst your bubble Rick. Even though it’s called Reality TV, it’s far from what really happened. The only place this episode belongs is in a classroom for TV Production/Editing students. Google “prohibited transaction” and “IRA”. Read a few lines and see what kind of interesting questions come to mind. I’m a brazilian man and in my language the show was confusing. In the end, looks like Marcus is firing Becky. But now I understood what happened. Becky, Do you get paid from the show for being a participant?